 It is agreed by any party or entity by registering with AllSurplusWorld/AllServiceWorld (ASW) that the following terms and conditions are simultaneously accepted without any reservation. ASW shall not be obliged to undertake any investigation nor verification as to the lawful and/or truthful contents of the information provided by advertisers and shall not accept any responsibility or liability for the source and the accuracy of any information contained and shown anywhere on its site (www.allsurplusworld.com) and does not warrant for value or quality of the goods or properties or services advertised, nor warrant for the reputation of its advertisers, the advertised ratings or quantities, for locations, configurations and suitability of the goods or properties or services advertised. By using the services and information provided by AllSurplusWorld/AllServiceWorld it is formally and legally agreed upon by the user, subscriber or advertiser to protect and warrant ASW against all charges and claims either from any public party, local, state or federal authority, by virtue of national or international adopted trade rules including embargo or quota rules or any specific regulations imposed by any nation or group of nations or UN adopted rules and resolutions in the process being directly or indirectly engaged or involved in any activity pertaining or arising from using ASW or its facilities as well as for factual or consequential losses deriving for the user thereof. ASW at all times may refuse to any party or parties to supply information and/or advertisements to its site and remove contents and/or information at any time and at its own judgement or discretion without prior notice to the provider of the information and/or users. ASW has the right to remove information already supplied by such refused or excluded party or parties and does not assume nor accept any responsibility directly or indirectly arising as a consequence of executing its rights to impose exclusion to any party or parties so described. The contents of this disclaimer and the terms and conditions thereof may be subject to change without notice. ASW is not obliged to inform users of any changes. ASW is not restricted in the distribution of information as made available by advertisers or users. Once registered with ASW it is implicitly agreed that all information is at free disposal of ASW subject to its mailing facilities and all information received shall not be considered spam neither its use as a spamming action whatsoever. If ASW registers a company/entity it is agreed by the registered party that this registration is accepted as long as no cancellation/removal instruction in writing is received or to be carried out by ASW. ASW rates are subject to change without prior notice. Prices are supposed to be in Euro�s (the currency of the EEC / European Central Bank) Exchange rates are to be understood as approximate market rates at contracting date. Measurements are supposed to be metric. Conversion rates as shown in the metric conversion table are to be understood as a guide to assist users. ASW does not assume any responsibility for the precision and/or accuracy of both the currency and metric conversion information.